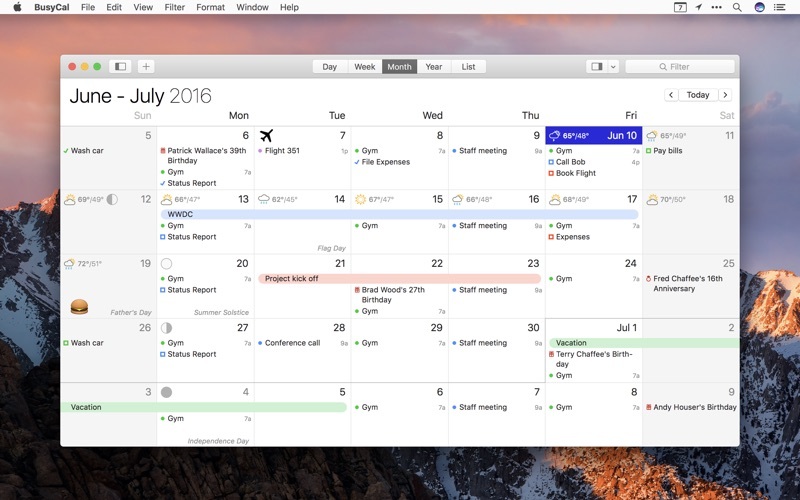 BusyCal 3 is the most powerful, flexible, reliable calendar app for macOS. It's packed with innovative, time-saving features including customizable views, integrated to dos, travel time, maps, natural language input, weather, moons, graphics, tags and more. 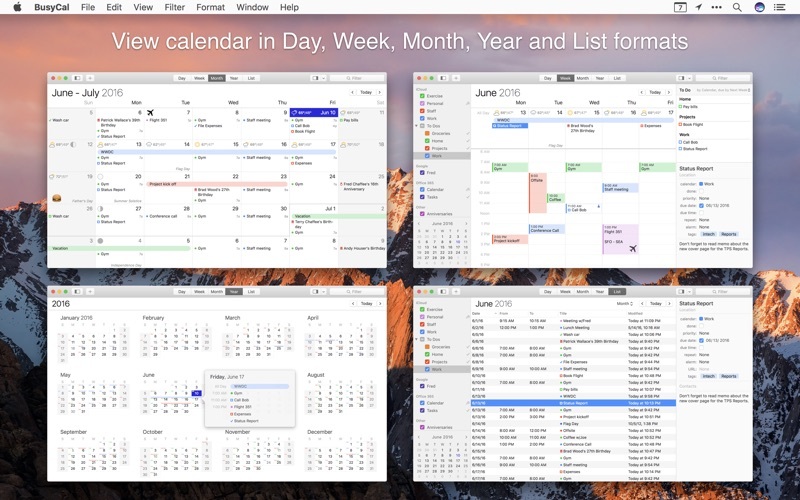 BusyCal displays your calendar in Day, Week, Month, Year and List views. What makes BusyCal unique is its ability to customize these views to more precisely meet your needs. You can choose the number of weeks shown per month, or days shown per week, and you can even customize the calendar's appearance by choosing a font face and size, calendar colors, time format and more. In BusyCal, To Dos are integrated into your calendar, display on the date or time they are due, and carry forward until completed. You can also display a To Do List in the sidebar. 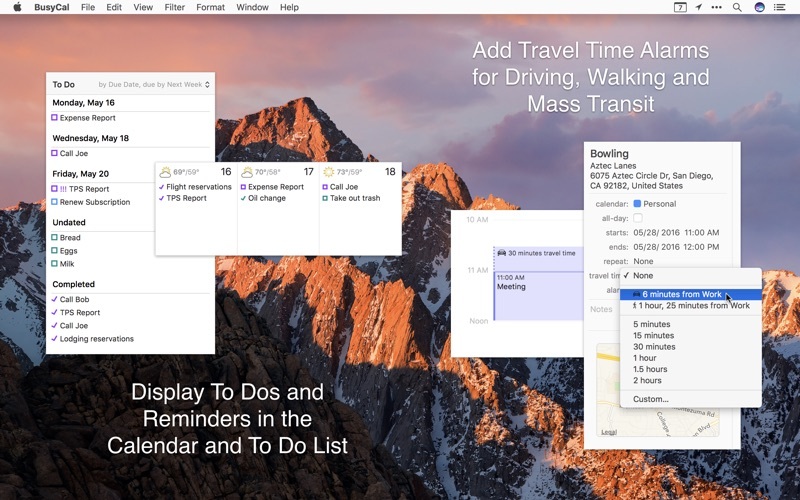 To Dos in BusyCal are compatible and sync with the Reminders app on Mac and iOS. BusyCal's info panel enables you to quickly view and edit event details with speed and precision. The info panel can be displayed in the sidebar, as a popup or a floating window. And it's completely customizable, you can choose from a wide range of attributes to display including time zones, tags, maps, private notes, last edit time and more. BusyCal enables you to create events and to dos using natural language. A preview of the event details are displayed while you type as it recognizes titles, dates and times, locations and more. You can even use it to add contacts or attendees to an event, set alarms, add URLs, and to indicate the calendar to create the event on. BusyCal allows you to block out time for walking, driving or taking mass transit to an event or location. You can set a fixed amount of travel time or determine it automatically using the integrated support for Location Services and Apple Maps. You can even receive alerts when it's time to leave as traffic conditions change. The BusyCal menu bar app is always running, even when the main BusyCal app is not running, so you always have access to your schedule. 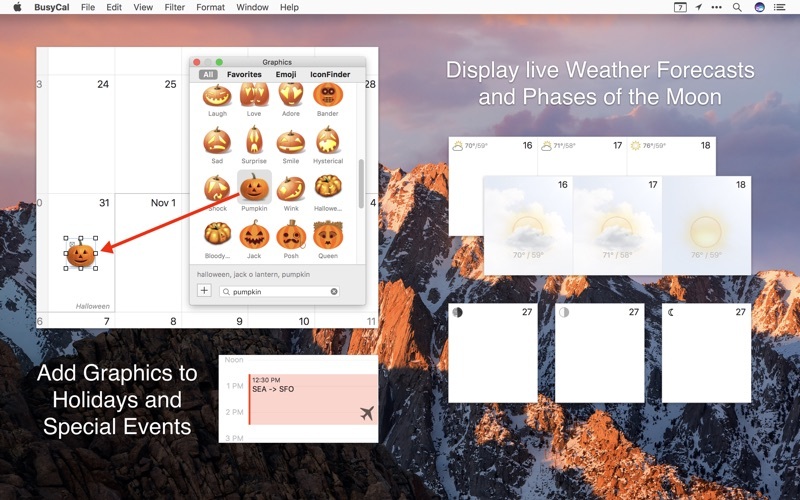 It displays a mini-month, a scrolling list of your events and to dos, and the weather forecast. You can click on an event to view its details, and create new events and to dos using natural language. 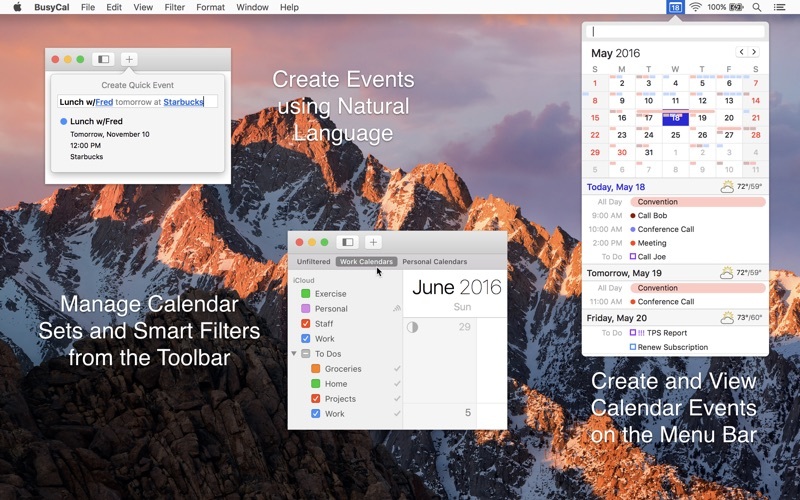 BusyCal's Smart Filters are a powerful tool for managing your calendar. Smart Filters can be accessed with a keyboard shortcut or a button on the toolbar to display calendar sets (showing/hiding multiple calendars), perform saved searches (events that contain 'Joe'), apply view settings (an 8-week month view) and much more. BusyCal displays alarms in a movable, resizable floating window that offers the ability to snooze an alarm for any number of minutes from now or before the start of an event, or snooze multiple alarms at once. And BusyCal Alarms trigger even when the main BusyCal app isn't running, so you'll never miss an important appointment. BusyCal displays a live 10-day weather forecast, phases of the moon, and sunrise and sunset times. BusyCal lets you add graphics to your calendar to highlight holidays and special events. You can choose from the built-in Emoji and IconFinder images, or drag images from your desktop or web. BusyCal integrates with its sister app, BusyContacts, forming a flexible easy-to-use CRM solution. By adding contacts to events in BusyCal, you have instant access to a contact's email address and phone number, as well as a record in BusyContacts of your interactions with them. 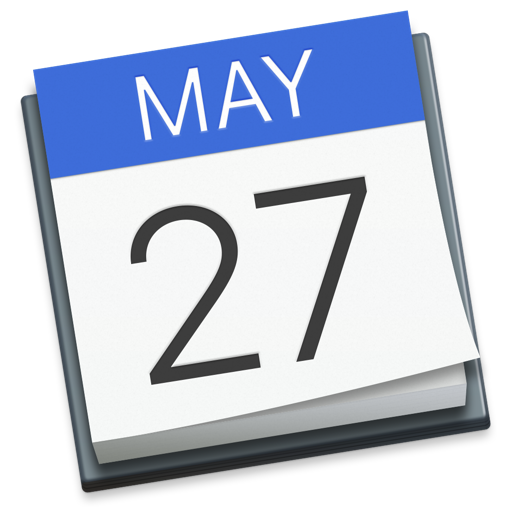 BusyCal supports iCloud, Google, Exchange and CalDAV servers, enabling you to sync calendars with other Macs and iOS devices running BusyCal or the built-in Calendar app. This includes the ability to share calendars, schedule meetings, and view the availability of others. Цена : 3 790 р.